Hint: If you are searching for something specific, use the "find" option of your browser (ctrl+f). Why should I register with my email address? Why should I register with a password? Can you remove some old posts of mine? I don't want them there anymore. I just posted and then received a message that it was a moderated forum, and I should wait. What does this mean? I marked all posts read by mistake. How do I undo it? I have posted a question, but no one is replying. Why? How can I find more information about a member? How do members' statuses change? Why are some users regular members, senior members, etc.? It seems that the ranking of a member is based solely on the number of postings made; however, does it apply to his/her English language & grammar knowledge? All the notification messages are sent to my bulk box even though after many times I've tried to put them back into my inbox. Why? When I click videos, I see a box full of different-sized words. What are these? How do I spot a scammer? Registering with your email address will allow you to recover your password, should the need arise. If your email address isn't verified, all your posts will have to be approved by a moderator before they are published. You also won't be able to get any email notifications. If you provided your email address during the registration process, a verification email will be sent to it automatically. After registration, you can verify your email at any time by going to your "Email + Notifications" tab in your "Settings" page. If you haven't received an email within 2 hours, please make sure you check your bulk/spam folders. IMPORTANT NOTE: Yahoo!, Hotmail and AOL are using overly strong spam-blocking filters that might stop you from receiving any emails from us. You might have to set up your spam filters to allow mails from the .com domain. After that's done, re-send a verification email via your "Settings" page. If you still have problems receiving a verification email, contact an administrator by writing in the Help Forum: Help Forum . If you don't have a password, you won't be able to log in to your account again once you're logged out. Registration allows you to browse the forums ad-free and post new threads and replies using your registered screen name. Some forums are only visible to registered members. You can upload a profile picture (avatar) and upload pictures into your gallery for others to see. You can now also view other members' profiles, and you will be able to add other members as friends and keep track of their posts and other activities. Mouse over your name in the top right-hand corner and click on the the "Settings" link. There you will see 4 tabs which will allow you to edit your profile in many ways. Mouse over your name in the top right-hand corner, and click on the the "Settings" link. Go to the "Account" tab and you'll see the "Sign-in name" option. If it's not available, contact an administrator by writing in the Help Forum . 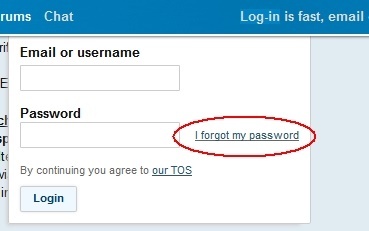 Click on the "I forgot my password" link next to the password box on the log-in the pop-up window and follow the instructions. Yes. Mouse over your name in the top right-hand corner and click on the the "Settings" link. Go to the "Account" tab, and you'll see "Delete my account permanently" button. If you have more than 1000 posts, you will have to contact an administrator to have your account deleted. You can do that by writing in the Help Forum . 1) On the Homepage, you can use the Question Box (see the screenshot below). After you've filled in the subject and the text of your message, click on the "Next" button and you'll be asked to choose a forum to publish your post in. 2) On the Forums page, you can see the list of available sections. Browse through this page and chose the correct forum you wish to post in. Click the "Write a new post" button, or use the Question Box within the forum. When you use the Question Box within a forum, your post will be published in that forum. 3) Use the "Have a question" button found on both the Homepage and the Forums page. After you've filled in the subject and the text of your message, click on the "Next" button, and you'll be asked to choose a forum to publish your post in. Please try to find the appropriate section for your post, since this will help you find the right people to answer it. 1) You can reply to a post directly from the Homepage by using the suggested reply box. 2) After reading a thread, click on the "Reply" button on any of the posts to add a new post to the thread. This will take you to the new post window which opens the editor for you to write in. After you've hit the "Reply" button, you will see the post you are replying to above the editor. On the upper right of that post you will see the "Quote" button. You may also highlight a part of that text and press 'Quote’. You will see a link "attach an image" above the editor buttons. You can upload more than one picture at a time. That would be against a basic principle of discussions: you can't erase what you have already written and posted. Every discussion would turn into a mess and couldn't be called a discussion anymore. There is a time frame of 20 minutes in which you can edit your post, but only if there are no replies. Generally we do not delete any posts inside a thread where answers have already been made. This would cause confusion and disturb the flow of the thread. It would also be unfair to the members who have taken time and effort to help you. Requests for post deletion can always be made, and we will gladly consider individual requests. Please make sure you are aware that we generally do not delete anything once it's posted, so before you post, be sure you still want the post there in the future. I just posted to the forums and received a message that it was a moderated forum and I should wait. What does this mean? It means that it will not be posted directly, but will go to a "moderators" section where a moderator reviews the post and will either approve it (post it), edit it (make changes to it), or delete it. This is to avoid misuse of certain sections on the forums. The post might not have been in the correct forum and a moderator moved it, or the post did not follow our guidelines and it was deleted, or the post was a duplicate. For any of these reasons, you should get an email informing you of the reason if you are a registered member and you have opted to receive emails. If you are Anonymous, you will receive no notification. I want to find a post that I have posted before. How can I find it? There are two ways to find your posts and threads you've participated in. 1) Click on your name on the top right corner of this website and you will see your profile. Underneath your user name will be the number of posts you have made. Click this and it will show all your posts. You can also find your latest posts in your profile by clicking on the "Activity" tab. 2) Mouse over the "Home" tab at the top of the page. In the pop-up menu, choose the "My Topics" link. You'll be redirected to the list of topics you've participated in. I marked all posts read by mistake. How do I undo this? Since there is no record of your previous unread/read status, it cannot be undone. It is everyone's right to remain anonymous, and some visitors are prevented from registering by their company or institution Internet policy. Of course we would prefer everyone to register, because it is more motivating and personal to answer a question a member has made rather than a post by an anonymous user. The threads in our Controversial forum tend to attract unpleasant posts, simply because they tend to deal with race, religion, politics, etc. If we lifted the moderation, it would of course be possible to delete such posts later; but it would make for a very ugly atmosphere in the meantime. The same applies to Anonymous posts. We also want to control spam, duplicate posting, etc. I have posted a question, but no one has replied. Why? There are a lot of posts and only so many helpers around to answer them. Anyone can post an answer, but many of the members feel a bit shy about this, so most answers come from a fairly small group of people. Everyone is here voluntarily, so sometimes, unfortunately, no one has time to deal with a particular post. Please DO NOT 'double-post' or post the same question twice. This is discourteous to our volunteers. Be patient and await a response. Those who repeatedly double-post or post again on their own thread only in order to renew its position ('bump the thread') will be put on moderation and have both posts deleted. Register and log in before posting—messages from people we feel we have come to know and regular visitors will naturally be more attractive to us than the hundreds of Anonymous posts, where we don't even know that the poster will bother to come back and read our reply. Become an active member of the forum, answering other posts as well, and you will become part of our community and be more likely to get answers in return. Make the subject line interesting and descriptive of the contents of the post. Just 'hello' or 'help' do not really catch the eye when you are scanning a long list of unanswered posts. Don't take it personally; we all have busy lives, and sometimes posts just stack up and get missed due to lack of time. In the New People section on the Homepage, try answering a few introductions instead of just posting your own, there are lots of people feeling the same way that you do. Clicking on your user name will bring you to your profile page. Your gallery is displayed on your profile, and you can view your pictures by clicking on them, which will allow you to see comments, edit the tags, etc. Also, when you mouse over your name at the top right of the screen, you can see the "upload pictures" link, which allows you to upload more pictures to share with others on the forums and to change their descriptions and titles. There is another upload button under the "Home" tab in the top menu. You can do this by selecting a picture in your gallery and clicking "Set as profile photo". Also, you can upload directly by clicking "Account Settings" and uploading a picture from there. Once you have moved your picture into the upload box, you can chose share options: your pictures can be made viewable by everybody, by all registered users or by your Friends only. In posts, you can click on the name of the member who wrote it, which will take you to their profile page. You can view the profile of a member only if you are registered. You can also use the "Search" function at the top of the page to search for a member. How do members' statuses change? Why are some users "regular members", "senior members", etc.? Your member status changes with the number of posts you have contributed to the forums. Moderator - A super-user who takes care of the forums. You have the ability to message a moderator privately, should you wish. Moderators have a range of elevated privileges including deleting, editing and moving posts when needed. Trusted User - Trusted Users are given additional capabilities at the site, such as private messaging to all users and other advanced features. You can only be promoted to this role by an Administrator. Proficient Speaker - Users in this role are known to maintain an excellent grasp of the English language and the ability to explain it clearly. You can be promoted to this role only by the EnglishForward team. Teachers - Users in this role are DELTA, CELTA, TESOL, CELTAYL, TEYL, TEFL or similarly qualified teachers. To become a member of this group, you must send a private message with a scan of your certification to an Administrator. Retired Moderator - A moderator who has retired from active daily participation. These icons are placed under the avatar to the right of each post. Clicking on them will show you the list of members that fall under this role. This does not mean that other members, junior or otherwise, are not excellent advisors. The site administration can only manage with and monitor a limited number of these valued assistants. In the end, this is the internet, and you can only see what you read on your screen: you must consider the advice given and decide for yourself whether it is of value to you. How do I start a conversation—send a private message (PM)—to another member? Go to the profile of the member and you will see the option on the bottom left. Generally, you must be Friends with this member before being able to contact them. They also have to have "Allow conversations from friends" enabled in their profile. Some members will chose to allow conversations from all users or no one, depending on their settings in their profile. All the notification emails are sent to my bulk box, even though I've tried to put them back to my inbox many times. Why? If this happens, you need to check your junk filter settings. Usually you will find an option to add a "safe sender". By adding tags to your post and photos, you give information to the forums concerning what the post is about. That way, other users can find your post if they search for the relevant tags. When I click "All Videos", I see a box full of different-sized words. What are these? That is called a tag cloud: the larger the word, the more times someone has posted a video with relevance to that word. By clicking that word you will pull up all videos with that tag. Clicking a word again will pull up all videos with both the first and the second word. We’ve implemented it so that our members more or less define the quality of our site. They can chose to rate pictures, comments, posts and members either Up or Down by one vote. View this thread for a detailed explanation of the rating power and the other rating numbers displayed in your profile. You can let the community know when you will be gone for a while. We call this holiday mode, and it can be set in your profile. Your status will then be set as “Away”. Scammers are all over the internet, and unfortunately on EnglishForward as well. We try to catch them before any harm is done, but it's not always possible. By reporting these scammers, you will help us a great deal. View this thread for some examples of their messages. If you still have questions on how to use the site, feel free to ask us in the Help Forum. The Questions Are Of Importance To Me.